We are delighted to send you an update on the future of the Global Article 9 Campaign and to share information on Article 9-related developments that have occurred in recent weeks. During the Conference and its follow-up, Conflict Prevention, Disarmament for Development and the Environment, and the Human Right to Peace have emerged as the main themes for the future of the campaign. These three themes, in which the Global Article 9 Campaign can play a meaningful role and contribute significantly in the future, encompass many dimensions, ranging from nuclear abolition to peace education, demilitarization to peacebuilding, and much more. Currently, Campaign and Conference organizers and secretariat members are having ongoing discussions towards conceptualizing the general directions and defining concrete actions for the next steps of the campaign in these areas. We look forward to strengthening partnerships and developing joint activities, in the fields of research, advocacy and education. The fourth Tokyo International Conference on African Development (TICAD) was held in late May 2008. Discussions focused on poverty, AIDS and development issues. While the Ministry of Foreign Affairs only issued a limited number of passes to NGOs to participate in the actual TICAD meeting, over a hundred participants from Japanese and African NGOs, as well as government and UN officials met in a parallel civil society session. Secretary General of the Global Article 9 Conference and leader of the Peace and Human Rights Unit for the 2008 G8 Summit Kawasaki Akira participated in the NGO session and seized this opportunity to speak about the Global Article 9 Conference and Campaign, and more specifically on the potential of Article 9 as a peace mechanism and its relevance in peacebuilding. In light of the debate on Japan's dispatch of Self-Defence forces to Sudan, he called for a discussion on the forms that Japan's peacebuilding efforts in Africa should take, questioning whether sending troops would be the best way for Japan to foster peace in Africa. He warned that Japan's contributions should not serve as an excuse for expanding its deployment overseas. As the G8 Summit was held in Japan's Lake Toya early July, civil society members from Japan and around the world gathered in Hokkaido. The Global Article 9 Campaign also traveled there to report the outcomes of the Global Conference that took place in May, and monitor the summit from the perspective of Article 9's principles of disarmament for development, and peace as a human right. A workshop was held as part of the People's (Alternative) Summit in Sapporo, focusing on A World Without War - the Role of the G8 and Japan's Peace Constitution. Speakers from Peace Boat, the Foundation for Human Rights in Asia, the Japan Catholic Council for Justice and Peace and a special guest from Action Aid Bangladesh shared the outcomes of the Global Article 9 Conference to Abolish War, and participated in a lively discussion on the significance of the campaign for both Japanese domestic politics and the broader international peace movement. Debate ranged from topics as varied as the role of the media, links between war and poverty, and how pacifism is seen from conflict regions. Rashed Al Titumir of Action Aid shared his perspective on the importance of Article 9 as a mechanism for disarmament and peacebuilding, ending with the memorable quote that "there were two important achievements for humanity at the end of World War II. The first is the UN's Universal Declaration of Human Rights; the second is Article 9 of Japan's Constitution." Lobbying activities at the International Media Centre also highlighted Article 9 and its relation to disarmament, non-proliferation and development. The Global Article 9 Conference's statement to the G8, endorsed by the Japan Organizing Committee and key international participants and supporters, was introduced. This statement calls for the G8 countries, who together make up 70% of the world's military expenditure, to reduce the money spent on arms and redirect resources to peace, development and the environment. Japan has announced it will send Ground Self-Defense Forces to Southern Sudan as part of UNMIS, the UN peacekeeping mission that monitors the 2005 ceasefire agreement. Such dispatch will be the first Japanese full-fledged participation in UN peacekeeping operations since 2002. Japan's Foreign Ministry had long been pushing for the dispatch of SDF in Sudan, but the Defense Ministry had been cautious because of safety concerns. But the objections of the Defense Ministry were overruled by the imperative of using the momentum created by the G8 summit, during which African issues were at the top of the agenda. Indeed, Prime Minister Fukuda Yasuo announced Japan's contribution to UNMIS peacekeeping operations during UN Secretary General Ban Ki-Moon's visit to Japan, a few days ahead of the summit. Reactions to a SDF deployment in Sudan have been varied. In 2002, Japan passed a special law concerning its participation in UN operations, but the constitutionality of the International Peace Cooperation Law is debated, for it substantially departs from the original interpretation of Article 9. In addition, Japan is considering deploying Self-Defense Forces personnel on the ground in Afghanistan and providing airlift cargo as part of its logistic support for the International Security Assistance Force (ISAF). The plan is presented as part of non-military activities of ISAF led by NATO. Such deployment would have to be approved in the Diet when the antiterrorism special law comes up for renewal in January. Last year, Japanese Prime Minister Yasuo Fukuda faced vigorous opposition before being able to renew the so-called Anti-Terrorism Special Measures Law, which authorizes the Maritime Self-Defense Force to refuel US vessels in the Indian Ocean for their operations in Afghanistan. And in May 2008, a court ruled Japan's Air Self-Defense Forces' airlifting activities from and to Iraq were unconstitutional for they contravened the war-renouncing Article 9 of the Constitution. 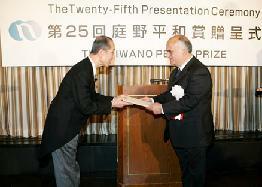 In May, the Niwano Peace Foundation awarded its 25th Niwano Peace Prize to His Royal Highness Prince El Hassan bin Talal of Jordan "for his tireless efforts toward building peace with justice in the Middle East"
Following the award ceremony, Prince Hassan addressed a symposium on the "Challenges Facing Religious People in the New Century." In his remarks, he noted the role that Article 9 of the Japanese Constitution has played in developing common standards of comprehension and shared understanding since the end of World War II. Named after the late founder of the Buddhist organization Rissho Kosei-kai, Rev. Nikkyo Niwano, the Niwano Peace Foundation promotes research and other activities based on a religious spirit that contribute to the realization of world peace and the enhancement of a culture of peace. Established in 1983, the Niwano Peace Prize honors and encourages individuals and organizations that have contributed significantly to inter-religious understanding and cooperation. Several guests and participants to the Global Article 9 Conference have written reports and articles providing their own in-depth and personal account of the conference.